The Los Angeles Kings are a professional ice hockey team based in Los Angeles. They are members of the Pacific Division of the Western Conference of the National Hockey League (NHL). The team was founded on June 5, 1967, after Jack Kent Cooke was awarded an NHL expansion franchise for Los Angeles on February 9, 1966, becoming one of the six teams that began play as part of the 1967 NHL expansion. The Kings played their home games at The Forum in Inglewood, California, a suburb of Los Angeles, for thirty-two years, until they moved to the Staples Center in Downtown Los Angeles at the start of the 1999–2000 season. The National Hockey League's Pacific Division was formed in 1993 as part of the Western Conference in a league realignment. It is also one of the two successors of the Smythe Division, though of the current teams, only the Anaheim Ducks and Vegas Golden Knights did not play in the Smythe Division. Due to subsequent realignments, three of the Pacific Division's original teams left the division in 1998 but returned in 2013. The division is the only one in the NHL without any Original Six teams. During the 1970s and early 1980s, the Kings had many years marked by impressive play in the regular season only to be washed out by early playoff exits. Their highlights in those years included the strong goaltending of Rogie Vachon, and the "Triple Crown Line" of Charlie Simmer, Dave Taylor and Hall of Fame player Marcel Dionne, who had a famous upset of the uprising Edmonton Oilers in a 1982 playoff game known as the Miracle on Manchester. In 1988, the Kings traded with the Oilers to get their captain Wayne Gretzky, leading to a successful phase of the franchise that raised hockey's popularity in Los Angeles, and helped raise the sport's profile in the American Sun Belt region. Gretzky, fellow Hall of Famer Luc Robitaille and defenseman Rob Blake led the Kings to the franchise's sole division title in 1990–91, and the Kings' first Stanley Cup Final appearance in 1993. Rogatien Rosaire "Rogie" Vachon is a Canadian retired professional ice hockey goaltender who played for the Montreal Canadiens, Los Angeles Kings, Detroit Red Wings and Boston Bruins in the National Hockey League. Charles Robert Simmer is a retired ice hockey forward, most notably for the Los Angeles Kings in the National Hockey League, who was notable for his scoring and power play prowess. David Andrew Taylor is a Canadian retired professional ice hockey player who played in the National Hockey League (NHL) with the Los Angeles Kings from 1977 to 1994. Following his playing career, he served as the Kings' general manager from 1997 to 2006, and currently serves as Vice President of Hockey Operations with the NHL's St. Louis Blues. After the 1993 Finals, the Kings entered financial problems, with a bankruptcy in 1995, which led to the franchise being acquired by Philip Anschutz (owner of Anschutz Entertainment Group, operators of Staples Center) and Edward P. Roski. 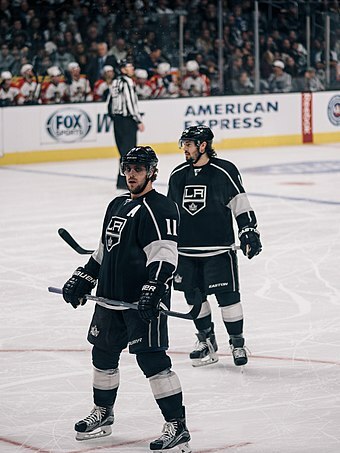 A period of mediocrity ensued, with the Kings only resurging as they broke a six-year playoff drought in the 2009–10 season, with a team that included goaltender Jonathan Quick, defenseman Drew Doughty, and forwards Dustin Brown, Anze Kopitar and Justin Williams. Under coach Darryl Sutter, who was hired early in the 2011–12 season, the Kings won two Stanley Cups in three years: 2012, over the New Jersey Devils, and 2014, against the New York Rangers while Quick and Williams respectively won the Conn Smythe Trophy. Philip Frederick Anschutz is an American billionaire businessman who owns or controls many companies in a variety of businesses, including energy, railroads, real estate, sports, newspapers, movies, theaters, arenas and music. He is a philanthropist whose name appears on medical and educational institutions to which he has donated millions. Anschutz has been described as a Christian conservative. The Anschutz Entertainment Group (AEG) is an American worldwide sporting and music entertainment presenter and a subsidiary of The Anschutz Corporation. It is the world's largest owner of sports teams and sports events. Under the AEG Live brand, it is the world's second largest presenter of live music and entertainment events after Live Nation. 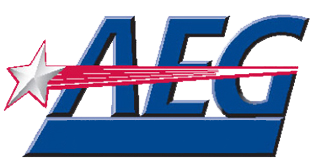 AEG Live was started in 2002. The 2009–10 Los Angeles Kings season was the 43rd season for the National Hockey League franchise. For the first time since the 2001–02 NHL season, the Kings qualified for the Stanley Cup playoffs. The Forum was the second home of the Kings. The Forum was home of the Kings from 1967 to 1999. The Stanley Cup is the championship trophy awarded annually to the winner of the National Hockey League (NHL) playoffs. It is the oldest existing trophy to be awarded to a professional sports franchise, and the International Ice Hockey Federation (IIHF) considers it to be one of the "most important championships available to the sport". The trophy was commissioned in 1892 as the Dominion Hockey Challenge Cup and is named after Lord Stanley of Preston, the Governor General of Canada who donated it as an award to Canada's top-ranking amateur ice hockey club. The entire Stanley family supported the sport, the sons and daughters all playing and promoting the game. The first Cup was awarded in 1893 to Montreal Hockey Club, and winners from 1893 to 1914 were determined by challenge games and league play. Professional teams first became eligible to challenge for the Stanley Cup in 1906. In 1915, professional ice hockey organizations National Hockey Association (NHA) and the Pacific Coast Hockey Association (PCHA) reached a gentlemen's agreement in which their respective champions would face each other annually for the Stanley Cup. It was established as the de facto championship trophy of the NHL in 1926 and then the de jure NHL championship prize in 1947. Jack Kent Cooke was a Canadian-American businessman in broadcasting and professional sports. Starting in sales, Cooke was very successful, eventually becoming a partner in a network of radio stations and newspapers in Canada. After failing at starting a major league baseball team in Toronto and being turned down to own a television station in Toronto, Cooke moved to the United States and built a business empire in broadcasting and professional sports franchises. Cooke was the owner of the Washington Redskins (NFL), the Los Angeles Lakers (NBA), the Los Angeles Kings (NHL), the Los Angeles Wolves and Toronto Maple Leafs (IL). He also developed The Forum in Inglewood, California, and FedExField near Landover, Maryland. The 1967–68 Los Angeles Kings season was the first season for the Kings in the National Hockey League. The Kings qualified for the Stanley Cup playoffs but lost in their first playoff series. Long Beach is a city on the Pacific Coast of the United States, within the Los Angeles metropolitan area of Southern California. As of 2010, its population was 462,257. It is the 39th most populous city in the United States and the 7th most populous in California. Long Beach is the second-largest city in the Los Angeles metropolitan area and the third largest in Southern California behind Los Angeles and San Diego. Long Beach is a charter city. After being eliminated in the first round of the playoffs in both 1973–74 and 1974–75, the Kings moved to significantly upgrade their offensive firepower when they acquired center Marcel Dionne from the Detroit Red Wings. Behind Dionne's offensive prowess, the strong goaltending of Rogie Vachon, and the speed and scoring touch of forward Butch Goring,  the Kings played two of their most thrilling seasons yet, with playoff match ups against the then-Atlanta Flames in the first round, and the Boston Bruins in the second round, both times being eliminated by Boston. The 1973–74 Los Angeles Kings season was the Kings' seventh season of play. The 1974–75 Los Angeles Kings season was the Kings' eighth season of play. Marcel Elphège "Little Beaver" Dionne is a Canadian retired professional ice hockey centre who played 18 seasons in the National Hockey League for the Detroit Red Wings, Los Angeles Kings and New York Rangers. Marcel Dionne was inducted into the Hockey Hall of Fame in 1992. In 2017 Dionne was named one of the '100 Greatest NHL Players' in history. Acquired by the Kings in 1975, Marcel Dionne was paired with Dave Taylor and Charlie Simmer. The line, known as the Triple Crown Line, went on to be one of the highest-scoring line combinations in NHL history. The Kings acquired Wayne Gretzky in a blockbuster trade with the Edmonton Oilers in 1988. He was named team captain the next year, maintaining the position until he was traded in 1996. Acquired in trade with the New York Rangers in 1995, Mattias Norström was named as the team captain in 2001, maintaining the position until he was traded in 2007. Afterwards, during the off-season, Luc Robitaille turned down a one-year deal with a substantial pay cut and ended up signing with Detroit, as the Red Wings represented his best chance at winning the Stanley Cup, and like Tomas Sandstrom before him in 1997, Robitaille won the Stanley Cup with Detroit in 2002. The Kings started off the season with a sluggish October and November, and then found their game again to finish with 95 points. They in fact were tied in points with the second place Phoenix Coyotes, and only finished third in the Pacific Division and seventh in the West due to a goals-for differential—the Coyotes having 228 and the Kings having 214 as a team. In the playoffs they met the Colorado Avalanche once again, this time in the first round. The series would prove to be a carbon copy of their previous meeting, with the Kings behind three games to one and bouncing back to tie the series, only to be dominated in the seventh game and eliminated. The next seasons would be major disappointments as the Kings hit another major decline, missing the postseason up until the 2009–10 season. Drafted by the Kings in the late–2000s, Anze Kopitar (left) and Drew Doughty (right) helped the team become playoff contenders in the early–2010s. 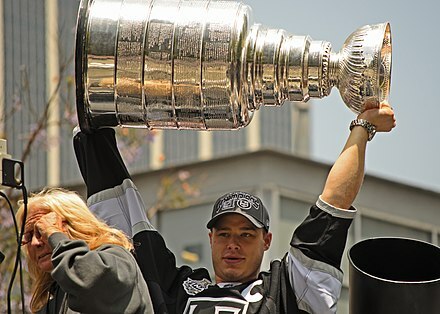 Dustin Brown with the Stanley Cup during the Kings' victory parade, after defeating the New Jersey Devils in the 2012 Stanley Cup Finals. Eric Garcetti, the Mayor of Los Angeles, looks out at the crowd during the Kings' 2014 victory parade. Emerging as the 2014 Stanley Cup champions, the Kings won their second Stanley Cup in three years. The Kings celebrated their 50th anniversary during the 2016–17 season along with the other still active 1967 expansion teams (the St. Louis Blues, Philadelphia Flyers, and Pittsburgh Penguins), and for the first time since 2002, they hosted the NHL All-Star Game. Goaltender Jonathan Quick suffered an injury on opening night that sidelined him for most of the season, and the Kings struggled without him. Backup Peter Budaj filled the void, earning his first starting duties since his time with the Colorado Avalanche six years earlier, but near the trade deadline, the Kings traded him to Tampa Bay for another goalie, Ben Bishop who shared the crease with Jonathan Quick down the stretch, the superstar having returned from his injury. Despite the trade, the Kings ultimately missed the playoffs for the second time in three seasons and, in the offseason, fired General manager Dean Lombardi and head coach Darryl Sutter. Assistant general manager Rob Blake was promoted to be the new general manager and John Stevens took over as head coach after serving as associate head coach for the Kings for several seasons. In the 2017 NHL Expansion Draft, the Vegas Golden Knights drafted defenseman Brayden McNabb, who had been left unprotected by the Kings. In the next season, the Kings clinched the playoffs as a wild card, but were swept by the expansion Golden Knights. 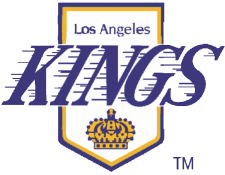 The original logo of the Kings used from 1967 to 1982. The primary logo used by the Kings from 1982 to 1988. 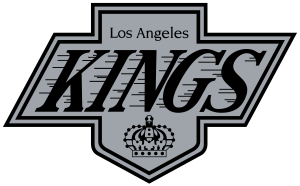 The Kings' logo from 1988 to 1998. The word mark was used on their black helmets from 2008 to 2013, and white helmets from 2011 to 2013. Kings' logos used from 1998 to 2011. The shield logo (left) served as the team's primary logo until 2002, when the alternate crown logo was designated as the Kings' primary logo. The shield logo was retained as the team's alternate logo until 2011. Adidas signed an agreement with the NHL to be the official manufacturer of uniforms and licensed apparel for all teams, starting with the 2017–18 season, replacing Reebok. The home and away uniforms that were debuted in the 2007–08 season remained identical with the exception of the new Adidas ADIZERO template and the new collar. With the new collar, the NHL shield was moved to the front and center on a pentagon with a new "Chrome Flex" style. The waist stripes on the road white jersey became curved instead of being straight across. 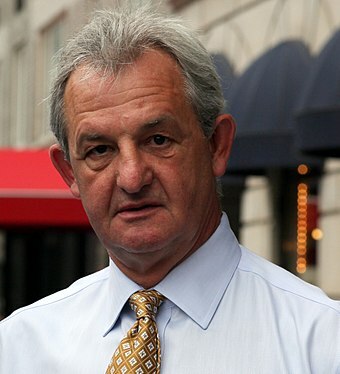 Darryl Sutter was the head coach of the Kings from 2011 to 2017. 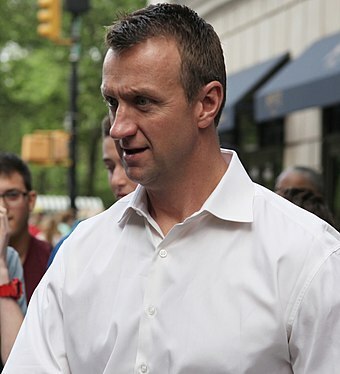 Rob Blake is the present general manager for the Kings. He was named to the position in 2017. Luc Robitaille's number was retired by the Kings on January 20, 2007. He was later inducted in the Hockey Hall of Fame in 2009. 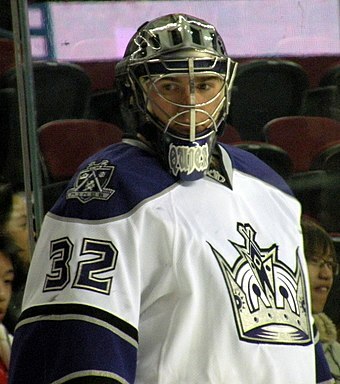 Recording 10 shutouts during the 2011–12 season, Jonathan Quick holds the franchise record for most shutouts in a season. Daryl Evans is the Kings' current radio color commentator. Luc Jean-Marie Robitaille is a Canadian professional ice hockey executive and former player. He currently serves as president of the Los Angeles Kings of the National Hockey League (NHL). Robert Jesse Pulford is a Canadian retired professional ice hockey forward who played for the Toronto Maple Leafs and Los Angeles Kings in the National Hockey League. He later served as head coach of the Kings before spending 30 years with the Chicago Blackhawks as a coach or executive. The 1991–92 NHL season was the 75th regular season of the National Hockey League. The Pittsburgh Penguins repeated as Stanley Cup champions, winning a best of seven series four games to none against the Chicago Blackhawks. The 1988–89 NHL season was the 72nd season of the National Hockey League. The Calgary Flames won an all-Canadian Stanley Cup final against the Montreal Canadiens four games to two. As of the end of the 2017–18 NHL season this is the last time two Canadian teams faced each other for the Stanley Cup. 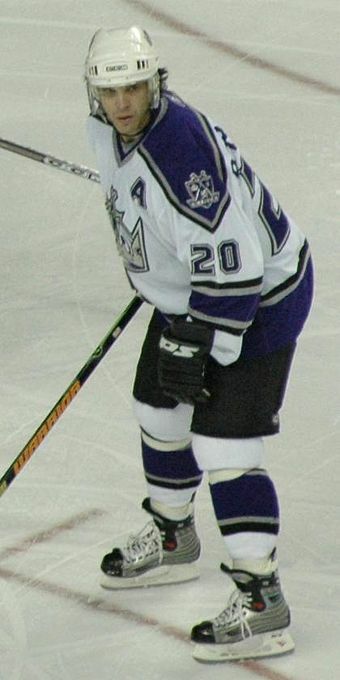 The 2006–07 Los Angeles Kings season was the 40th season for the National Hockey League franchise. This season marked the beginning of a rebuilding phase, as the team hired Marc Crawford as their new head coach, the former general manager of the San Jose Sharks, Dean Lombardi, as their new GM, former NHL goaltenders Ron Hextall as assistant GM, and Bill Ranford as goaltending coach. Their first big move came when they acquired rookie prospect Patrick O'Sullivan, along with a 2006 first-round draft pick, from the Minnesota Wild for forward Pavol Demitra on June 24, 2006. The 1988–89 Los Angeles Kings season saw the Kings finish second in the Smythe Division with a record of 42-31-7, for 91 points. The 1992–93 Los Angeles Kings season was the Kings' 26th season. The highlight of the season involved appearing in the Stanley Cup Final. During their playoff run, the Los Angeles Kings played against Canadian teams all throughout the playoffs. Robert T. Janecyk is a retired American professional ice hockey goaltender who played 110 games in the National Hockey League for the Los Angeles Kings and Chicago Blackhawks. The 1987–88 Los Angeles Kings season saw the Kings finish in fourth place in the Smythe Division with a record of 30 wins, 42 losses, and 8 ties for 68 points. The team finished last in the league in goaltending, with 359 goals allowed. They lost the Division Semi-finals in five games to the Calgary Flames. The 1984-85 Los Angeles Kings season was the 18th in franchise history. Following a fifth-place finish the previous season under three different coaches, Pat Quinn was hired as the new head coach of the Kings. In his first season, he returned them to the playoffs after a three-year absence with a 23-point improvement in the standings. But despite the goal scoring brilliance of Marcel Dionne and Bernie Nicholls, the Kings could not duplicate their Miracle on Manchester performance this time, losing to the Edmonton Oilers in three straight games in the Smythe Division semi-finals. The 1976–77 Los Angeles Kings season was the Kings' tenth season of play. The 2013–14 NHL season was the 97th season of operation of the National Hockey League (NHL). This season features a realignment of the league's 30 teams from a six to a four division format. The regular season began Tuesday, October 1, and concluded Sunday, April 13. The Stanley Cup playoffs began April 16. The 2012 Stanley Cup Finals was the championship series of the National Hockey League's (NHL) 2011–12 season, and the culmination of the 2012 Stanley Cup playoffs. The Western Conference playoff champion Los Angeles Kings defeated the Eastern Conference playoff champion New Jersey Devils four games to two, capturing the first Stanley Cup title in the team's 45-year history, dealing the Devils just their second Stanley Cup Finals defeat in five tries and first since 2001. Kings goaltender Jonathan Quick was awarded the Conn Smythe Trophy as the Most Valuable Player of the playoffs. The history of the Los Angeles Kings of the National Hockey League begins in 1966, as the league prepared a major expansion for the upcoming season, and awarded a new team to Los Angeles-based entrepreneur Jack Kent Cooke, who also owned the Los Angeles Lakers. While the Kings awaited construction to be completed on their future home, The Forum in Inglewood, California, they played their first two games during their inaugural 1967–68 season at the Long Beach Arena. The first game in Kings history was played on Oct. 14, 1967 and the Kings defeated the fellow expansion Philadelphia Flyers 4-2 in front of 7,023. They also played 14 games at the Los Angeles Memorial Sports Arena while awaiting the completion of the construction of the Forum. The Kings hosted their first game at the Forum on Dec. 30, 1967, a 2-0 loss to the Philadelphia Flyers. They went on to play their first 32 seasons at Forum before moving to the Staples Center in Downtown Los Angeles in 1999. ↑ "Staff Directory" (PDF). 2017–18 Los Angeles Kings Media Guide. NHL Enterprises, LP. September 25, 2017. Retrieved December 9, 2017. ↑ "2011-2018 Los Angeles Kings–Greatest NHL Uniforms". GreatestNHLUniforms.com. NHL Enterprises, L.P. Archived from the original on April 6, 2018. Retrieved December 21, 2018. Continuing the retro rotation, the Kings went back to the colors that had the original purple: black and silver. ↑ Ward, Doug (February 19, 2014). "Timeless Style". LAKings.com. NHL Enterprises, L.P. Retrieved April 6, 2018. ↑ The National Hockey League Official Guide & Record Book/2017. Toronto, Ontario: Dan Diamond and Associates, Inc. 2016. p. 67. ISBN 978-1-894801-31-7. ↑ "Gretzky's trade to L.A. 25 years ago still creating ripple effect". The Hockey News. The Canadian Press. August 8, 2013. Retrieved February 1, 2018. ↑ Los Angeles Kings Media Relations Department (1993). 1993–94 Kings Media Guide. Los Angeles Kings. p. 115. ↑ Donovan, Michael Leo (1997). The Name Game: Football, Baseball, Hockey & Basketball How Your Favorite Sports Teams Were Named. Toronto: Warwick Publishing. ISBN 1-895629-74-8. 1 2 3 4 5 6 7 8 9 "Los Angeles Kings Uniform History". Los Angeles Kings. Retrieved July 25, 2012. 1 2 Crowe, Jerry (November 30, 2007). "Text Messages From Press Row". Los Angeles Times. Retrieved August 22, 2010. ↑ Los Angeles Kings Media Relations Department (1997). Los Angeles Kings 1997–98 Media Guide. Los Angeles Kings. p. 3. 1 2 Los Angeles Kings Media Relations Department (1997). Los Angeles Kings 1997–98 Media Guide. Los Angeles Kings. p. 4. 1 2 3 4 Los Angeles Kings Communications Department. 2007–08 Los Angeles Kings Media Guide. p. 202. ↑ Los Angeles Kings Communications Department. 2007–08 Los Angeles Kings Media Guide. pp. 178–187. ↑ Duhatschek, Eric; et al. (2001). Hockey Chronicles. New York City: Checkmark Books. ISBN 0-8160-4697-2. 1 2 3 Los Angeles Kings Communications Department (2007). 2007–08 Los Angeles Kings Media Guide. Los Angeles Kings. p. 4. ↑ Peng, Sheng (December 21, 2016). "50 Forgotten Stories: Remembering Juha Widing". NHL.com. Retrieved April 8, 2019. ↑ Matsuda, Gann (November 8, 2010). "Former LA Kings And Montreal Canadiens Great Rogie Vachon Still on the Outside Looking In". FrozenRoyalty.net/Gann Matsuda. Retrieved October 31, 2012. ↑ Los Angeles Kings Communications Department. 2007–08 Los Angeles Kings Media Guide. p. 114. ↑ Matsuda, Gann (February 24, 2010). " "Butch Goring Was The LA Kings' First Star, Fan Favorite". FrozenRoyalty.net/Gann Matsuda. Retrieved July 25, 2012. ↑ Miller, Bob; Schultz, Randy (2006). Bob Miller's Tales From The Los Angeles Kings. Champaign, Illinois: Sports Publishing, LLC. pp. 105–109. ISBN 1-58261-811-9. ↑ McCarthy, Dave, ed. (2007). National Hockey League Official Guide & Record Book 2008. Triumph Books. p. 152. ISBN 978-1-60078-037-0. 1 2 Los Angeles Kings Communications Department. 2007–08 Los Angeles Kings Media Guide. p. 5. ↑ "SPORTS PEOPLE; 'Intolerable Position'". The New York Times. October 7, 1987. Retrieved March 20, 2008. ↑ Los Angeles Kings Communications Department. 2007–08 Los Angeles Kings Media Guide. p. 180. ↑ Crowe, Jerry (December 7, 1987). "Murphy Is Fired by Kings : Poor Record Cited; New Haven Coach May Get the Job". Los Angeles Times. Retrieved March 20, 2008. 1 2 Dodds, Tracy (May 3, 1989). "Kings' Success Doesn't Save Ftorek's Job : With Lack of Players' Support, Controversial Coach Is Fired". Los Angeles Times. Retrieved January 7, 2016. 1 2 3 "Playoff Games 1980s". Los Angeles Kings. Retrieved March 20, 2008. ↑ Miller, Bob; Schultz, Randy (2006). Bob Miller's Tales From The Los Angeles Kings. pp. 123–127. ISBN 1-58261-811-9. ↑ Zupke, Curtis (January 19, 2014). "Sunday Long Read: Roots take hold in California". National Hockey League. Retrieved June 18, 2014. ↑ Roderick, Kevin (December 2001). "The Big Chill". Los Angeles Magazine . Retrieved February 7, 2006. ↑ "New Kings Coach Expects Great Things". Chicago Tribune. June 1, 1989. Retrieved January 7, 2016. ↑ Weinberg, Rick. "Gretzky passes Howe as all-time scoring leader". ESPN . Retrieved October 29, 2012. ↑ Springer, Steve (March 30, 1991). "Kings Clinch First Division Title". Los Angeles Times. Retrieved March 20, 2008. ↑ "Playoff Games 1990s". Los Angeles Kings. Retrieved March 20, 2008. ↑ "Kings Get New Coach From Detroit System". Philadelphia Inquirer. June 26, 1992. Retrieved March 20, 2008. ↑ Sadowski, Rick (1993). Los Angeles Kings: Hockeywood. Sagamore Publishing. p. 29. ISBN 0-915611-87-2. ↑ Kalinowski, Mike; Zager, et. al., Jeremy. Los Angeles Kings 2013–14 Media Guide. Los Angeles Kings. p. 131. 1 2 3 Los Angeles Kings Communications Department. 2007–08 Los Angeles Kings Media Guide. p. 203. ↑ Miller, Bob; Schultz, Randy. Bob Miller's Tales From The Los Angeles Kings. pp. 155–160. 1 2 3 4 Matsuda, Gann (2012-05-29). "Mystery, Intrigue Surrounding Former LA Kings Defenseman Marty McSorley's Illegal Stick Likely To Live on For Eternity". FrozenRoyalty.net. Retrieved 2014-06-05. ↑ Miller, Bob; Schultz, Randy. Bob Miller's Tales From The Los Angeles Kings. pp. 160–167. ↑ Fischler, Stan (1999). Cracked Ice: An Insider's Look at the NHL. Lincolnwood, Illinois: Masters Press. ISBN 1-57028-219-6. ↑ Los Angeles Kings Communications Department (2002). Los Angeles Kings 2002–03 Media Guide. Los Angeles Kings. p. 8. ↑ Teaford, Elliott (February 27, 2001). "Trade Gives Kings What They Need". Los Angeles Times. Retrieved January 7, 2016. ↑ Dillman, Lisa (October 6, 1995). "Kings' Sale Cleared by Bankruptcy Judge". Los Angeles Times. Retrieved January 7, 2016. ↑ "A Look Back at 1998 And 'The Hit'". LAKings.com. 2012-05-01. Retrieved January 7, 2016. ↑ "L.A. Kings Fire Coach Robinson". CBS News. Associated Press. April 19, 1999. Retrieved January 7, 2016. ↑ "KINGS ALL-TIME ARENAS: 1967 – PRESENT". Los Angeles Kings. Retrieved 2016-01-04. 1 2 "Playoff Games 2000s". Los Angeles Kings. Retrieved March 20, 2008. ↑ Los Angeles Kings Communications Department. 2005–06 Los Angeles Kings Media Guide. p. 8. ↑ Los Angeles Kings Communications Department. 2005–06 Los Angeles Kings Media Guide. p. 205. ↑ "One on One with Luc Robitaille". Hockey Hall of Fame. 2011-05-27. Retrieved 2016-01-05. ↑ Kinkopf, Alex (2014-10-29). "Lined up: Before the 70's". LAKings.com. Retrieved 2016-01-05. ↑ Rosen, Dan (22 November 2009). "Kings' rebuilding plan ahead of schedule". Los Angeles Kings. Retrieved 2016-01-05. ↑ LeBrun, Pierre (2010-04-06). "Stars are the difference for Canucks". ESPN. Retrieved 2016-01-05. ↑ "Joe Thornton's OT goal sends Sharks to first-round series win". ESPN. Associated Press. April 26, 2011. Retrieved June 18, 2014. 1 2 3 Markazi, Arash (June 7, 2014). "These Kings built for Cup grind". ESPN. Retrieved January 30, 2016. ↑ Matsuda, Gann (June 12, 2012). "Los Angeles Kings Win 2012 Stanley Cup, Turning Dreams into Reality, The Unthinkable into Fact". Gann Matsuda/FrozenRoyalty.net. Retrieved July 31, 2015. ↑ Dillman, Lisa (June 11, 2012). "Kings Win The Stanley Cup With 6–1 Victory Over Devils". Los Angeles Times. Retrieved November 2, 2012. ↑ "Kings, Quick agree in principle on 10-year deal" (Press release). Los Angeles Kings. June 28, 2012. Retrieved July 25, 2012. ↑ Markazi, Arash (January 13, 2013). "Kings trade for Anthony Stewart". ESPN. Retrieved 2016-01-07. ↑ Muir, Allan (April 29, 2013). "NHL playoffs preview: No. 4 St. Louis Blues vs. No. 5 Los Angeles Kings". Sports Illustrated. Retrieved May 31, 2013. ↑ Dater, Adrian (May 11, 2013). "NHL playoffs: L.A. Kings eliminate St. Louis Blues with 2–1 victory in Game 6". Sports Illustrated. Retrieved May 31, 2013. ↑ LeBrun, Pierre (June 8, 2013). "Blackhawks Roll Right into A Finals Berth". ESPN. Retrieved July 31, 2015. ↑ "LA Kings Season in Review – How Did We Get Here?". National Hockey League. April 21, 2014. Retrieved June 9, 2014. ↑ Kalinowski, Mike. Los Angeles Kings 2015–16 Media Guide. Los Angeles Kings. p. 299. ↑ "Blackhawks Eliminated in 5–4 Loss to Kings". NBC Chicago. June 1, 2014. Retrieved June 9, 2014. ↑ "Montreal Canadiens' playoff run ends with Game 6 loss to New York Rangers". National Post. May 29, 2014. Retrieved June 9, 2014. ↑ Masisak, Corey (June 14, 2014). "Kings' road to second Cup much harder than 2012". National Hockey League . Retrieved June 15, 2014. ↑ "Kings making history with comebacks". National Hockey League. June 8, 2014. Retrieved June 15, 2014. ↑ "Kings forward Williams wins Conn Smythe Trophy". National Hockey League. 2014-06-15. Retrieved 2014-06-18. ↑ Horgan, Colin (October 6, 2014). "NHL Is Back – And If The Kings Don't Win, Someone Else in California Probably Will". The Guardian. Retrieved July 31, 2015. ↑ Cronin, Michael (April 10, 2015). "Why Did The Kings Not Make The Playoffs?". SunTimes Network. Archived from the original on July 5, 2015. Retrieved July 31, 2015. ↑ "Five Reasons The Kings Didn't Make The Playoffs". National Hockey League. April 10, 2015. Retrieved July 31, 2015. ↑ Dillman, Lisa (April 10, 2015). "Kings Eliminated From Playoff Contention With 3–1 Loss To Flames". Los Angeles Times. Retrieved July 31, 2015. ↑ Gretz, Adam (April 9, 2015). "Is This The End of the Line for the Los Angeles Kings?" . Retrieved July 31, 2015. ↑ "Anze Kopitar is L.A. Kings' new captain". ↑ "Kings get Ben Bishop from Tampa Bay in exchange for Peter Budaj". ↑ "Los Angeles Kings fire coach Darryl Sutter, general manager Dean Lombardi". ↑ "Kings hire John Stevens as coach". ↑ "Las Vegas Golden Knights take Brayden McNabb off Kings' hands". ↑ Greenspan, Dan (November 4, 2018). "Stevens fired as coach of Kings, Desjardins named replacement". National Hockey League. Retrieved November 5, 2018. ↑ "Willie Desjardins Named Head Coach; John Stevens Relieved of His Duties". National Hockey League. November 4, 2018. Retrieved November 5, 2018. ↑ "Los Angeles Kings Rout Rival Anaheim Ducks in Coach Willie Desjardins' Debut". Sports Illustrated. Retrieved November 7, 2018. ↑ Peters, Chris (August 15, 2013). "Manchester Monarchs to honor LA Kings' infamous 'Burger King' jerseys". CBS Sports. Retrieved April 12, 2015. ↑ Stein, Jeannine (June 21, 1998). "The Kings' Purple Reign". Los Angeles Times. Retrieved January 31, 2016. ↑ "Kings To Wear Alternate Jersey Final Time on Tuesday". Los Angeles Kings. Retrieved April 5, 2013. ↑ "2010–11 Los Angeles Kings Legends Night". Los Angeles Kings. Retrieved March 19, 2013. ↑ "Ducks, Kings unveil Stadium Series special jerseys". National Hockey League. Retrieved November 26, 2014. ↑ "Kings unveil NHL Stadium Series uniform". National Hockey League. Retrieved February 24, 2015. ↑ "Kings unveil 50th anniversary jersey". National Hockey League. Retrieved November 25, 2016. ↑ "NHL, adidas unveil uniforms". National Hockey League. Retrieved 2017-06-24. ↑ "Adidas Unveils A New Look for the NHL". SportsLogos.net. Retrieved 2017-06-24. ↑ "LA Kings Debut New adidas Silver Jersey for 2018-19 Season". National Hockey League. Retrieved 2018-11-18. ↑ Arritt, Dan (September 11, 2011). "Ace Bailey still leaving gifts 10 years later". ESPN. ↑ Olson, Lisa (June 7, 2012). "Ace Bailey’s spirit lives on in hockey and the Los Angeles Kings". Sporting News. ↑ Hammond, Rich (September 9, 2011). "10 Years Later: Memories of Kings Scouts Still Strong". Los Angeles Kings/NHL.com Network. ↑ "Ducks-Kings Rivalry: Freeway Face-Off". Anaheim Ducks. November 13, 2007. ↑ Los Angeles Kings Communications Department. 2007–08 Los Angeles Kings Media Guide. pp. 140–144. ↑ "Los Angeles Kings Roster". NHL.com. Retrieved October 3, 2017. ↑ "Los Angeles Kings Hockey Transactions". TSN.ca. Retrieved October 3, 2017. ↑ Robitaille served as captain to start the 1992–93 season, while Gretzky was injured. Gretzky resumed his role as captain when he returned to the lineup. Robitaille again served as captain for the 2 final games of his career. ↑ "Anze Kopitar Named Kings' New Team Captain" . Retrieved 16 June 2016. ↑ "Todd McLellan Named Head Coach of LA Kings". Los Angeles Kings. April 16, 2019. Retrieved April 16, 2019. 1 2 Foster, Chris (2006-05-19). "Kings Set Their Sights on Crawford". Los Angeles Times. ISSN 0458-3035 . Retrieved 2019-02-21. ↑ Kalinowski, Mike; Zager, Jeremy, et. al. Los Angeles Kings 2011–12 Media Guide. Los Angeles Kings. pp. 230–233. ↑ "Perfect setting: Gretzky's number retired before All-Star Game". CNN Sports Illustrated. Associated Press. February 6, 2000. Archived from the original on November 12, 2013. Retrieved June 9, 2014. 1 2 3 4 5 Kings Communications Department (2017). Kalinowski, Mike; Fischermann, Eddie; Moeller, Jeff; Altieri, Michael; Nickson, Nick; Scheer, Erica, eds. "Kings in the Hockey Hall of Fame" (PDF). LA Kings 2017–18 Media Guide. Los Angeles Kings. p. 260. Retrieved May 4, 2018. 1 2 "Professional Hockey Athletic Trainers Society/Society of Professional Hockey Equipment Managers". Hockey Hall of Fame and Museum. 2018. Retrieved May 4, 2018. 1 2 "Foster Hewitt Memorial Award". Hockey Hall of Fame and Museum. 2018. Retrieved May 4, 2018. ↑ "Elmer Ferguson Memorial Award Winners". Hockey Hall of Fame and Museum. 2018. Retrieved May 4, 2018. ↑ Los Angeles Kings Communications Department. 2007–08 Los Angeles Kings Media Guide. p. 27. ↑ "BOB MILLER RECEIVES STAR ON WALK OF FAME". Los Angeles Kings. 2006-02-10. Retrieved May 24, 2013. ↑ Miller, Bob; Schultz, Randy. Bob Miller's Tales of the Los Angeles Kings. ↑ Matsuda, Gann (April 24, 2013). "Hall of Fame Announcer Bob Miller Publishes New Book About LA Kings 2012 Stanley Cup Run – Book Signing Events". FrozenRoyalty.net/Gann Matsuda. Archived from the original on 2013-04-30. Retrieved May 24, 2013. ↑ Rosen, Jon (March 2, 2017). "Bob Miller To Retire: Will Broadcast Final Two Regular Season Games". Los Angeles Kings. Retrieved June 14, 2017. ↑ "Alex Faust Named New LA Kings Play-by-Play Announcer". Los Angeles Kings. June 1, 2017. Retrieved June 14, 2017. ↑ Zupke, Curtis. "Kings games to move from AM radio to iHeartRadio this season". Los Angeles Times. Retrieved 2018-10-04. ↑ "LA Kings Leave AM Radio For Streaming Pact With iHeartRadio". Insideradio.com. Retrieved 2018-10-04. ↑ "Meet Your In-Arena Personalities". Los Angeles Kings. 2013. Retrieved February 21, 2013. ↑ "KINGS ALL-TIME MINOR LEAGUE AFFILIATES 1967 – PRESENT". LAKings.com. Retrieved 2016-01-31. 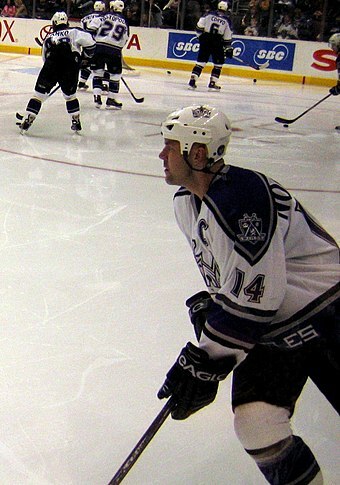 Wikimedia Commons has media related to Los Angeles Kings .